Earlier this year, the life of British playwright Joe Orton was celebrated in musical form in Orton at the Above The Stag Theatre. 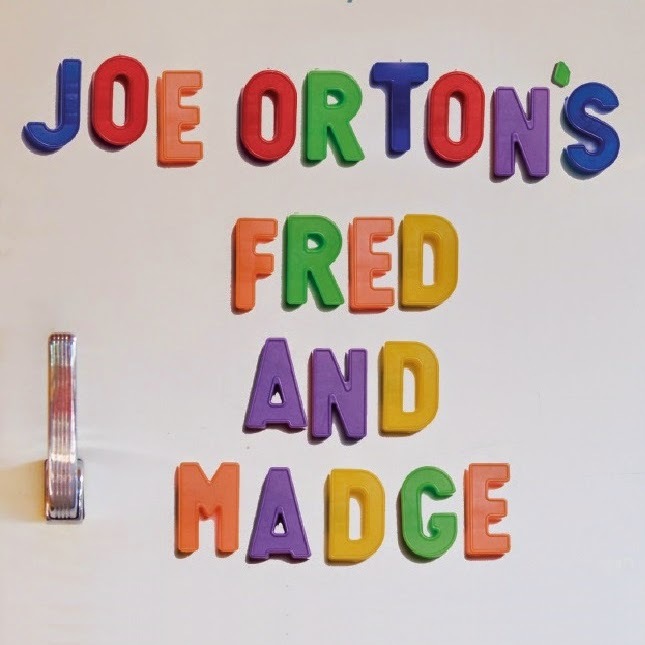 Now, Rough Haired Pointer are premièring Fred and Madge, Orton's first ever play that was written in 1959, discovered after his death in 1967 and later published in 2001. Sadly (yet understandably for a fledgling playwright), this is not Orton at his best. Fred and Madge is semi-biographical, the titular couple thought to be based on Orton's parents. Orton grew up in Leicester and hated the mundanity of working life there. The play is, therefore, something of a meditation on boredom - albeit a completely bizarre one. When we first meet the middle-aged couple they are, inevitably, arguing in their dingy suburban home, moaning about their gloomy lifestyle. 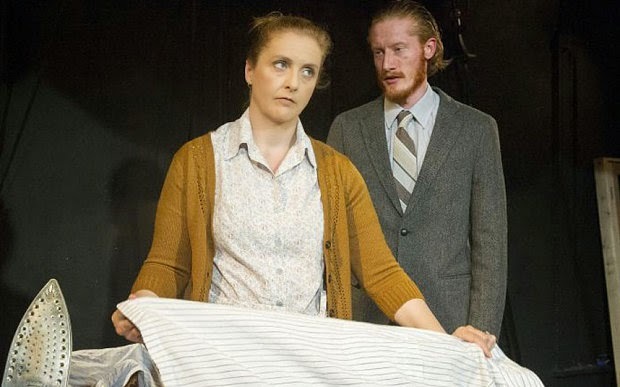 Fred (Jake Curran) spends his working days perpetually rolling a stone up a hill; Madge (Jodyanne Richardson) futilely sieves water in a bath tub. It's a satirical and depressing view of life. "Oh the boredom! the fatigue of living! ", says Fred in the opening scene, "No merriment, no whoopie, no frolics". Soon the play takes a turn for the surreal and absurd. This is, in fact, a play-within-a-play - Jordan Mallory-Skinner plays a director who appears from the audience to mastermind proceedings. There's certainly comic irony in the couple knowingly acting in a play of their own lives, but Mary Franklin's direction does little to differentiate between the two levels. What little narrative there is of the couple remarrying and eventually following their dreams in India is lost in confusion and disjointedness. There are flashes of wit and satire throughout, with some amusing lines and a scene involving a "insultrice" who insults various British establishments like the BBC. Yet, as the saying goes, only boring people are bored. Franklin does little to combat this. There are some zany characters performed for laughs by the supporting cast, but the overall narrative thread is lost in surrealism. And for a play that takes place in a number of settings - a children's playground, a factory, a theatre, a hospital and a garden for example - Christopher Hone's relatively unchanging design only heightens disinterest and provides little to signpost through the plot (though the use of trapdoors is cleverly done). Ultimately Fred and Madge is a confusing little play that this production fails to get to grips with. Not even Orton can make brilliance out of banality. Watch: Fred and Madge runs at the Hope Theatre until 18th October.